Who says Side-by-Sides are just for adults? I just purchased the Polaris Ranger RZR 170 Side-by-Side for my daughter. Now that we’ve had the machine for a week, I figured I would give you guys the low down on this little bugger. I’ll admit, while walking out the door I got a little uneasy about what I had just done. I asked myself, who in their right mind would spend five grand on a toy during these tough times? Add in the three year warranty, freight, prep and taxes and my total came to $5,000. I had to stop thinking of this and find a way to justify the money I just spent. I came up with an explanation that has allowed me to completely forget about the price. It starts with safety. Not only one but two of my precious little children are secure within the roll cage, safety nets and seat belts. It ends with the question, is my daughter worth it? Absolutely! Seen here is the RZR 170’s single A-arm, adjustable front shock and hydraulic disc brake. Before I let anyone drive the machine I wanted to determine the likeliness of a roll over, at least that’s what I told everyone so I could have first dibs. I was happy to learn that the weight limit is 300 pounds. I could actually drive my wife around in the little RZR, something I didn’t expect before the purchase. At 5’-8” I’m a little cramped. In fact, getting my left leg in required some meditation and a bit of Yoga, but my 5’-1” wife had no problems or complaints, she quickly popped right in like she was getting in a car. The owner’s manual said that it will go 15 mph from the factory but it felt more like 2 mph! I could walk faster, so two minutes after driving it – out came the throttle safety screw. Polaris says the four-stroke, air-cooled, 169cc engine with electric start and an automatic transmission will top out at 25 mph, honestly when you get that throttle regulator screw all the way out it feels as if speeds are much faster than that. I was impressed with how much torque the little four-stroke engine was able to make. After allowing the engine to work to its full capability I was able give the RZR 170 a good test while my kids, Cessie and Ace impatiently waited their turn on the trail. After weaving my way through off camber root-infested trails and high speed fields with 90 degree turns, all the fears I had earlier of a rollover were instantly gone. The machine didn’t push or tip once! Instead the wheels were planted firmly even when I turned as quick and sharp as I could. The more I drove it the more fun I had. Before long I was breaking the rear end loose and power-sliding through turns effortlessly. What a blast! The experience reminded me of my recent police training in a Crown Victoria cruiser. Like the cop-car, the RZR felt sure-footed and well balanced. 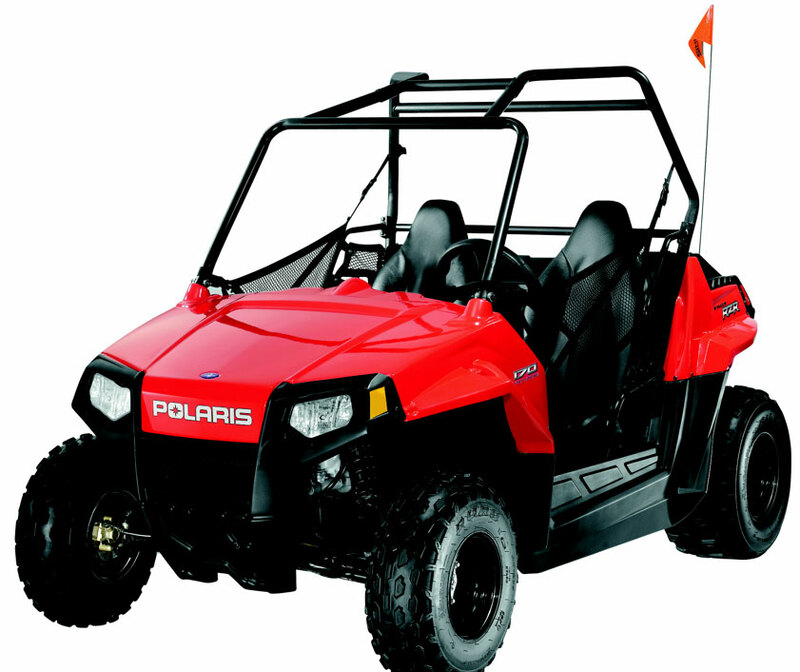 Polaris did well in the stability and handling department. The RZR 170 performed well above my expectations. Now that I drove the machine and learned how incredibly stable it is, I felt way more comfortable letting my little girl take her first drive in her new car. Money well spent, I thought to myself as she whizzed by with a big grin on her face. It was obvious she was having a complete blast and loved her new Polaris. After a few hours I was amazed at what a good driver she was. She pounded it through the rough stuff with help from the RZR’s 5 inch front and rear suspension, jumped it, roosted through turns and skidded it sideways with its four wheel hydraulic disc brakes. The suspension soaked up all she could give the little RZR, and believe me she gave it hell! It was certainly the best late Christmas present she ever received.